Said that the city is “thrilled by the partnership” with the magazine (the event was also part of the consultation on the transportation plan). This “collaboration raises our cool factor” because there is a different demographic for this event compared to the people we usually see at City events. He stressed that although it was partly about transportation they “want to go beyond how we move to how we be in space”. He cited Jan Gehl’s experience in Copenhagen when he recommended street cafes: the Danes said “We’re not Italians” but their behaviour has since changed and they now embrace street life. The City wants to emphasize public space: “we are increasingly taking civic life to the next level and the riot will not derail the process”. Started by thanking the sponsors who had made the road trip possible. This was the best turnout so far . The collaboration with re:place now means that spacingvancouver.ca is on line. Spacing started in 2002 in Toronto by a group of “urban curious” people looking at public space issues. They felt that the professionals understood the issue, the need was to convince the regular resident. It was to become an outlet to talk about public space issues. Transit for instance was treated as a exclusive concern but instead of dealing with “silos”, we should also be talking about density, development, design. One of the earliest issues that they dealt with was postering. The fight to save private (non-c0mmercial) postering. “Freedom of speech is a thjousand times more beautiful than clean lamp posts.” There have been 20 issues to date. Each covers a theme – water, transit etc and they use local blogs “to do daily stuff”. They hit upon the idea of using buttons as fund raisers. They are cheap to produce but people are willing to pay for them. They have since added magnets. These were based on the designs used for subway stations but without TTC logo and over 200,000 have been sold! They have also tried highway buttons, and on the city’s anniversary former component city logos (names like East York which disappeared with amalgamation but still command local loyalties). Don Cherry’s recent remark sparked the response with pinko buttons “left wing pinko” “bike riding pinko” sold 30,000 sold – nationally. They attempted to get an endorsement by promising funds for Cherry’s anti cancer charity but he responded “There [sic] still left wing pinkos to me” ! 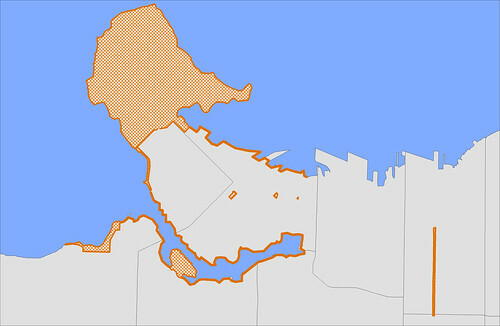 There is now a cross Canada urban blog network. The tour launches the first (paper) national issue. They have found that there are the same issues in every city – transit, waterfronts, public space, community, neighbourhood. 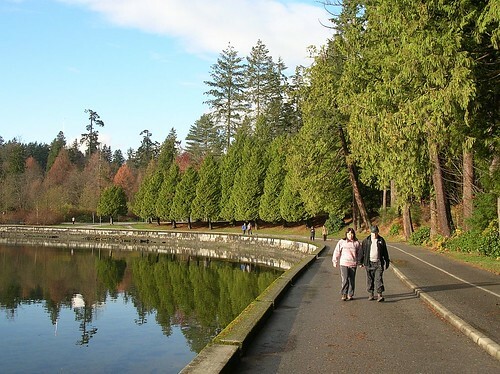 In the most recent survey they picked Vancouver’s Seawall as Canada’s best urban public space. The top ten list also included Granville Island. Her presentation can be found here. She created the map above of the top ten spaces in Vancouver which showed that they are all together around the core. This may be because of the “great transportation opportunities”. In great public space, cars are not king and “it feels like an outing, different from everyday”. Getting there is part of the experience. People don’t want a carnival band in their backyard. She also pointed to the failure of Jack Poole plaza and the “underbelly of Robson Square”. We are repurposing transportation spaces: streets can do that but where does mobility fit in? There are problems in giving up a street for a longer period of time than one parade day. Places being lively is what is important not current transportation patterns. He opened by commenting on the low average age of the audience: “something is going on”. He wanted to explore their ” generational perspective”. He said that the were two kinds of public spaces – destinations and “on the way”. His own personal favourite space is 2nd beach – which is part of what makes the Seawall great. Vancouver is shaped around 19th century streetcar grid. He cited the intersection of Denman and Robson where the two gas stations have gone. It was once typical of the motordom city but has since transformed. In his view the streetcar city is the best form that has been developed. There is no Vancouver equivalent to Pioneer Square in Portland [OR]. “We have no left over spaces”. Although Pigeon Park was left over from the interurban. When we want to celebrate, we stop traffic – 72nd and Scott Road in Surrey – how did they chose that? He found the question “what are your public spaces” to be highly subjective. It depend on the way you interact with the city. He asked what is the process of selection? There was a short list of 50 across the region that included Surrey and the North Shore [none of which survived the selection process]He said that it is not only hard to define, but how do you choose between them? is the senior editor of Spacing and specializes in the long “psycho-geographic walk”. He said that he felt as though “I am on a business trip cheating on my partner” (i.e. the City of Toronto). Why we did a national issue was the discovery that in indierock circles they speak of “Monronto” i.e. despite the claimed differences between the two cities as far as indie rockers are concerned they are the same. Canada is an urban nation. A lot of that so called identity junk would drop away if we recognized that. 80% of us are NOT rural . Our day to day lives have nothing to do with the Rockies or the Prairie. We have to slowly shift our idea of what Canada is. It is very significant that cities were not mentioned once in the recent national election debate. What makes these spaces successful? Erin – permanent – move through space – uncertainty about what to do with ourselves when we have spare time. You can walk and you don’t need to talk. There are no awkward silences. You feel like you are doing something. Shaun – In Toronto people are in a constant state of anxiety but they make eye contact in Vancouver. Toronto is now, slowly, embracing its beach culture – the height of modernity meeting nature. he cited the intersection of Denman and Davie as one the best examples of Vancouver’s public space. What can Vanvouver export (to other Canadian cities)? Gordon – Issue of the car: transportation choice no 1 is still the car. We tried to create spaces without cars – Leg in Boot Square – doesn’t work at all. Can’t drive to it or stop at it. We had to acknowldge that without auto access it doesn’t work. Erick – Public spaces are also good places for anarchy. Vancouver has no gathering space at City Hall compared to Toronto – we protest in front of the Art Gallery. Van designed that deliberately. You have to expect that and can’t be afraid of it. Toderian sum up – importance of not moving through: to get twice as many people you either have to attract more people which creates pressure on transportation OR you encourage people to stay twice as long (Jan Gehl). That is what should have been talked about. I must admit to some reluctance to attend this event. I spend most of my time on line and I do not buy “dead tree” glossy magazines with adverts. I have no subscriptions now to any paper publications. I also am deeply suspicious of anything sponsored by big banks in general and BMO in particular. Their only interest is in increasing their own, already immense, profitability. It also seems quite out of place for this to be a car based road trip. Yes they brought their bikes and went for long walks but driving across Canada seems a bizarre way to connect into the need to reduce auto-dependency in cities. The magazine is nicely produced and the advertising not too intrusive. Clearly like the federal government funding they get, it helps and does not get in the way much. The use of buttons as fund raisers is clever, but I already have way too many buttons as in this city they get given away at so many events. If anyone wants Vancouver transit buttons, let me know. I will happily pass them along as they just sit in a drawer. I was very pleased with Toderian’s summary as he captured exactly what I was thinking. The riot is a huge distraction. The media love it, as do the political reactionaries. Public space is needed for large, relatively infrequent events. But it is much more important to get the everyday right. What I learned at the last provincial election in East Richmond is that we have no public space at all. Everywhere that people gather is private space. Unlike Steveston – which has the waterfront – all we have is a dog walking park. And strip malls – private land, where canvassers can be told to leave. If I wanted to hold a rally, I would have to use a school playing field – which is all that our parks are. There is nowhere here to linger and people watch. Good public spaces positively encourage loitering. And while benches were mentioned, no one highlighted the significance of movable tables and chairs, which have been the key to success in converting streets in Manhattan to livable public spaces. The headline that caught my eye was one of those “no surprise there” moments: “U.S. Lags Behind China, Colombia in Bus Rapid Transit” In fact it probably safe to say that the US lags in nearly every aspect of urban transit – as well as inter city of course where China is rapidly building an intercity High Speed Rail system when states are returning federal funds allocated to them to study HSR! It is also worth noting that the story comes from the New York Times blog “Climate Wire”. So far as I know none of our mainstream media has anything like that. Irritatingly, but in common with most mainstream media web pages, there is a report on line but the NYT does not link to it. And one of the reasons for me posting this story to this blog is that even though I may have some issues with what that report says I think you should read it and have access to the whole thing since it is free and a pdf. It is worth noting that the report is well annotated and provides an extensive list of sources and references. The report is produced by The Institute for Transportation and Development Policy – which is genuinely independent. It was founded by Michael Replogle and has “transformed… from a small advocacy nonprofit to a leading international organization with over 60 staff members in offices in Africa, Asia, and Latin America” by its current Executive Director, Walter Hook. I make this point becuase BRT has caught the attention of a number of right wing organizations, such as the Reason Institute: not that they are transit advocates so much as advocates for reducing government spending, and BRT appeals to them. The idea was, after all, born out of poverty. Places like Curitiba and Bogota could not afford rail based rapid transit, but needed to do something both fast and cheap to reduce the impact of rapidly rising car use. We also need to be aware of what is right and wrong with BRT since our right wing government also likes the idea for most of this region and has talked a lot of it – especially when challenged by its commitment to expanding road networks and especially freeways. By the way, I cannot resist once again asking what on earth is happening to the Highway #99 bus lanes which were largely completed nearly a year ago and still remain out of use. BRT can be a useful stepping stone as a way of changing a region from low use bus ridership to something more transit oriented. It is not the only way that can happen. And many cities have been working hard to make their systems work better through the use of bus lanes, signal priority and other measures. Both London and Paris are in the process of building massive new rail systems as well, but have been upgrading the bus network at the same time as improving bike lanes and so on. It is as much an attitude of mind as anything else. In London they got serious about central area congestion and introduced “cordon pricing” – the congestion charge. At the same time, given the length of time it takes to build or improve rail based transit and the fact that the underground and surface systems were at or over capacity at peak times, improving bus service – speed and reliability – was the only way to go. But they did not go for the bells and whistles of BRT but rather a rolling programme of increasing services, buying more buses, and getting those buses through the traffic more effectively. It is this programmatic effect that I think we need to turn our attention to. The report is worth studying, and it has some really useful sources. But it also betrays its belief in magic bullets because when you check out its BRT checklist (The BRT Standard) you find a number of things there that really have little or nothing to do with better transit service quality. All of the world’s best BRT systems have their dedicated rights-of-way in the center of the road. This is true for streetcars and light-rail systems, and for the same reasons. The median may well be a good place to fit a new transit right of way into a highway oriented urban area. In much of the United States converting the median and centre lanes of freeways and expressways has been a common theme – for instance much of the Chicago elevated, outside of the loop, is in freeway medians. That does not make for good station locations. When the transit passenger gets off the vehicle, they become pedestrians again. And the last place a pedestrian wants to be is in a freeway median or on the centre of an interchange. These are very difficult locations to get too, and hard to convert into transit oriented development. Stations ought to be in central places not stuck out at the margins. Yes if you are going to do BRT in a US metropolis, by all means look at converting freeway and expressway lanes, but recognize that you will have an expensive project to convert such a place into an urban area. In the case of boulevards, I am also unhappy at ideas that suggest medians are good places for people. 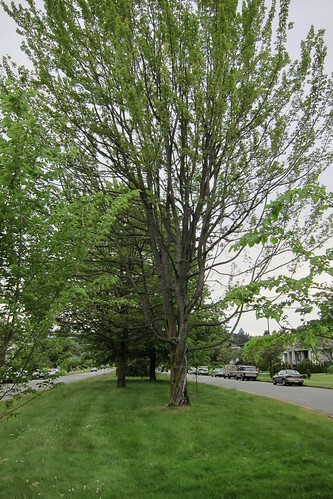 In Vancouver we are much more concerned about preserving medians for trees than people. “Stations occupy former road/median space (not sidewalk space)” – again much depends on location. I agree that sidewalk space should not be lost but a lot can be done through the use of set backs. I am especially interested in what can be done to civilize suburban streets, where often car parking is used between the back of the sidewalk and the front of the property. Bringing the buildings forward, widening the sidewalk and creating space – not for movement but for sitting and enjoying people watching – is what makes for a good urban space. If there has to be some parking it goes in the back or underneath the building. “Branding of vehicles and system” – if it makes the bus more identifiable then fine. But it really does very little compared to the things that are really important like increased service frequency. We have had branding here for a while, and it means almost nothing. B Line liveried buses work lots of routes that are not B Lines. The word “Express” gets used and abused. The B line you get on may or may not be branded. The high floor yellow coaches used for some freeway longer distance services turn up on Community Shuttles. Route #620 (the Ferry connection to Tsawwassen) is usually a low floor artic, not a high floor coach but spends most of its run on the freeway. “Performance-based contracting for operators” – this is the right wing way. Again, not really to do with passenger experience, although it can be, the reason that it is advocated is as a way of putting pressure on cost reductions. That is not say that it is not a useful device but it does have to be part of the a broader service based philosophy and has little to do with BRT per se. In the birth throes of the former GVTA when contracting out was supposed to be the way of the future, we even looked at adopting a passengers’ charter – something that had been widespread as Britain converted from nationalized industries to competitive private sector provision. It was a passing fantasy that did not survive long. It has to be admitted that increasing passenger numbers have been achieved in Britain, especially on the railways. But that has not lead to any decline in passenger complaints – of which complex (and high priced) fare systems and overcrowding are the greatest. “Peak-period pricing” – I have no idea why that is important in determining whether or not your system qualifies as BRT (see above) It might be a good idea. We used to have it system wide and people complained about how complicated it was. It now applies all day on weekdays. Incidentally, one thing I do notice when I get on the Canada Line to go downtown is how crowded the platform gets at 18:30 – and that is the time when trains are running into the yard out of service. “Platform-level boarding” – Many of the South American systems use high floor buses. I think this may have more to do with when they were introduced but it could also be a cost consideration. The stations are more expensive than simple bus stops, but the vehicles are cheaper to build and maintain. They also have flat floors throughout. 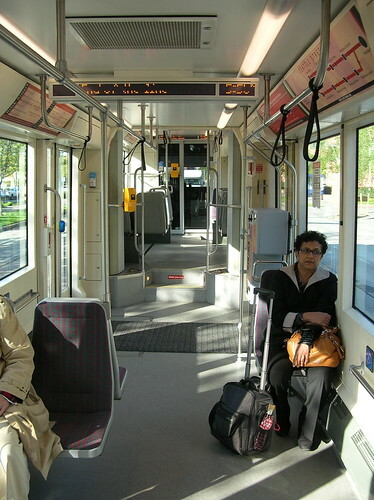 The problem we have with low floor buses – and is also very noticeable on some newer US tram and LRT systems – is that the low floor area is designed for wheelchairs, strollers and bikes. I also wonder about the number of items that get scored that are not about BRT but about having a decent transit system. These things need to be considered but again do not really make much of a difference when you do an analysis of BRT versus LRT. I wonder too about a table which has three times the points for cycle integration than pedestrian integration. We are all of us pedestrians most of the time: only a few of us are cyclists some of the time. It is also very clear from the table that Vancouver has never had BRT – and I will be very surprised if anything that is introduced in this region using buses scores very highly on this table. 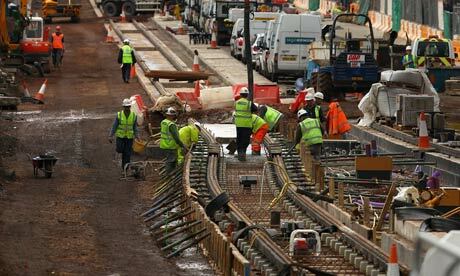 The Guardian has a story to-day about the latest developments in the saga of the Edinburgh trams. The project is already late and over budget but abandoning now would cost more than a partial completion. What attracted my attention was the picture accompanying the story which shows the construction site – which looks even more horrendous than Cambie Street at its worst. There is also a link within the Guardian’s story to the 35 page Council Report, for those who want chapter and verse. This, it seems to me, would be a very good example that could be copied by our local media, which so often only provide links within their own web empire but not to external sources. Every case is unique and different, of course. But Edinburgh is going to get cited by opponents of trams (or streetcars or whatever you want to call them) so even the proponents of this technology need to be aware of what went wrong there. And also, of course, what lessons that has for future projects in other places. Tyler Harbottle, in the Tyee, does not seem to think so. Although he does find “two renegades who do urge a rush to the barricades. Bianca Mugyenyi and Yves Engler are authors of a new book, Stop Signs: Cars and Capitalism: On the Road to Economic, Social and Ecological Decay, a war-chest of facts, figures and arguments identifying cars as enemies of the people.” So perhaps there ought to be. There certainly is an on going battle – or perhaps more of a rear guard action – between car advocates and cycling advocates. There is an especially nasty anti cyclist rant dressed up as news in the Courier this morning. What the car advocates fail to point out is that they have had it pretty much their own way for the last hundred years. And the results have not been pretty. There are also people who do, quite deliberately, target cyclists on the road and take pleasure in scaring them – and then hurling abuse. It is a form of road rage. There are also drivers – possibly the same individuals – who hate any other vehicle that gets in their way. Just drive at the speed limit on any road in Greater Vancouver and they will quickly identify themselves. Of course, there is not a lot they can do to intimidate trucks and buses – but they make life as difficult for them as they can. These people are essentially psychopathic – or have an anti-social disorder to use the latest jargon. Sadly some of them seem to be able to command a significant audience in the main stream media. Mostly, the politicians favoured by the elite do the bidding of the corporations – and on the whole they are still wedded to automobiles for themselves and as many as they can foist on the rest of us. It still suits their agenda, even though it is short sighted and self destructive. Unfortunately, lost in the cyclists versus car drivers debate is all the important stuff about what sort of place we want to live in, what our transportation choices have been doing to us and the place we live in and the planet we depend on. Notice too, how hard the car lobby tries to put the label of “moral superiority” on cyclists – and, by extension, anyone who has the temerity to suggest that we need more and better alternatives to driving everywhere. I suspect that is because they are aware at some level that they have already lost the argument. Cars did not bring us the great benefits they promised – and much of the time we spend in our cars is evidence that the system we have constructed – and are still constructing for it will never ever be enough – does not work very well even in its own terms. We do not have the freedom, mobility or accessibility we were promised. What we do have is, quite literally, killing us. And there are better ways of doing things that have been working well for many years in other places. And we cannot go on as we are. Cycling is going to be part of our future. So is walking and so is mass transportation of various kinds. Individual motorized transportation has got to be limited and reduced. And, on the whole, that will prove to be a boon. For while it seemed, once upon a time, that increased car use would have benefits, it is quite clear to anyone who has the requisite capability of making a rational assessment, that the costs of widespread car use far outweigh those benefits. Of course, in the media it is not arguments or facts that matter. Its the narrative – and the small c conservatives have understood how to do that better. Because they have had to, as reality has had a nasty habit of hitting them in the face. But, as we now know, they are immune to facts. The photo below is posted to flickr. The image in fact comes from there – I am just posting a link in a way that displays the image in the middle of my text. 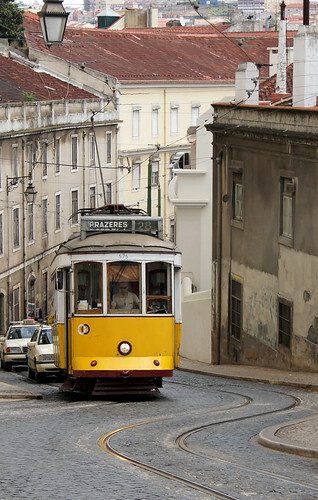 It was taken in Lisbon, Portugal – last month. As you can probably tell, this is an old tram – and it is a simple electric, steel wheel on steel rail vehicle, not a cable car or a rack railway. I like it because it reminds me of the number of times I have been told in all seriousness by certified professional engineers that a tram – streetcar – light rail vehicle – whatever you want to call it, cannot possibly climb a hill steeper than 6%. I have heard this about Burnaby Mountain, and why trams couldn’t possibly go to SFU. We need a cable car. We would had to have a tunnel or a major structure through the Miller Ravine because light rail just would never work on North Road. LRT could never be considered for Cambie Street past City Hall – its much too steep they said. I came across a blog post this morning that I was simply going to tweet or facebook. But then an idea occurred to me – I should use that blog as a template for something about here. Richard Layman is “an urban/commercial district revitalization and transportation/mobility advocate and consultant, based in Washington, DC.” What he espouses – in this article and in general – is something I have been advocating here. He says: “While I am based in and write about Washington, DC issues, I try to write so that “universal lessons” are evident in the entries.” I don’t know about all the entries – I will probably go back and check them out – but this one certainly struck a chord. I don’t like using the term “transit oriented development” or TOD, even though it is always on the tongue of planners, elected officials, and enlightened developers. For one, it’s not “transit” or “transit oriented development” per se that matters, it’s the integration of transportation and land use. For another, it’s about compact development. 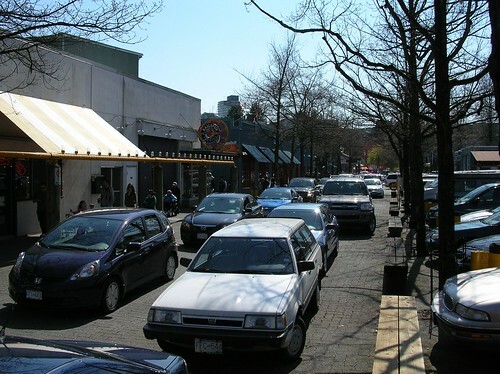 And generally, with compact development, it also becomes a matter of place and placemaking and quality of life, because compact development also means “mixed use” or the mixing of uses–residential, office, commercial, retail, public and civic–in ways that as David Engwicht would say, facilitates exchange while reducing the need to travel. I don’t know that “transit oriented development” is always “on the tongues planners, elected officials, and enlightened developers” . Indeed just sometimes might not be such a bad thing – but he is right, in that when terms like this do get thrown around they become “sound bites” and devoid of real meaning. I am afraid that “Smart Growth” has gone the same way, “sustainable transportation” never did mean anything and even though LEED certification might have been better than what came before, by leaving out location (the most important consideration in real estate) it became pointless. TOD has also become a bit of a red rag around here, because it is often spoken of at the same time as the idea that the transit provider should also be the real estate developer. That idea is very familiar to people from Hong Kong, but is really quite unusual anywhere else, and has its own balance of costs and benefits that I do not want to go further with here. 1. [There has to be] a transit network that is useful to the kinds of market segments you claim to want to reach. In other words, if you have some transit lines and stations but they aren’t well situated to take people from where they are to where they want to go then there is no value to locating by the stations. This is very much the problem of Greater Vancouver. The rapid transit lines serve downtown – but many of the jobs are elsewhere, often in the suburbs and not in the regional centres (designated or otherwise) but mostly in office parks at freeway exits. The take up of the Canada Line was much faster than expected – but I think that revealed simply that it was not big enough. It was undersized for what was there already, and is certainly going to be very expensive to expand if more TOD takes place. It’s not that I have any personal animosity about tall towers next to Marine Drive station. It’s just that there is lots of empty industrial space around there, and the trains are already full – northbound and southbound. It reminds me a bit of the Canary Wharf situation. All that was planned was the Docklands Light Railway – and it opened just before Canary Wharf did. So there was a short period of obvious mismatch – and then work started on the Jubilee Line extension – conventional deep level subway (or “Heavy” Rail I suppose). There is also nothing in the plans now to better utilize the CP line along Kent Avenue – though there was an idea, quickly dicarded, that it might be useful as an extension to an alternate to the Evergreen Line. Since the currently forested land south of Marine Drive and west of Boundary is going to be redeveloped at comparatively high density, some consideration of transit might have been a really good idea. For much of the region (outside of the Vancouver, North Richmond, a tiny bit of North Surrey, Burnaby and New Westminster served by rapid transit) there aren’t any options other than infrequent and unreliable buses. And until that gets much better, no-one can talk credibly about TOD here. And it is even harder in places where transit is promised (Port Moody, Coquitlam) but has not yet been delivered – and where it is a dim image portrayed only in long range “plans”. There is a huge credibility gap. And it is not helped at all by the current open squabbling over the Evergreen Line and future sources of revenue for transit expansion. 2. The land use around the station [must be] planned for compact development/urban mobility and spatial patterns. Layman does a tour of the Metro DC area pointing out what is missing from current plans. I can think of a few odd spots of compact development – some of them (like Joyce Collingwood) happily close to a transit station. I can think of a lot more low density, car oriented places where the planners are still firmly wedded to the “guidelines” of parking spaces and more lanes of traffic that were out of date when they were written in the fifties and seem more irrelevant as every day passes. I am sure that if you look around what is being built in your neighbourhood it will be very similar. There does seem to have a been a distinct shift of attitude in the Vancouver Engineering department – and pockets of hope in places like Port Moody and North Vancouver. The Millennium Line does now appear to be a catalyst for change – but Burnaby is still focussed on what was once “Big Bend” but is now “Big Box”. At one time, developers were deterred from going on to green space by the insistence on development in the regional centres first – which is how Metrotown got going. That no longer seems to be the case. But maybe the commenters will set me straight. They usually do. In fact I am going to throw open this as a challenge. Have a look at what Layman says about developments in DC and then in the comments below write about what is happening here. Ideally at transit stations but not exclusively – because we simply do not have enough for everyone. And since it isn’t TRANSIT oriented perhaps that doesn’t matter. Are there showplaces around here where there is integration of transportation and land use and compact development? Even if the only transit is now an infrequent community shuttle. Or are we only doing the soft shoe shuffle – mouthing the words of sustainability but in reality doing what we have always done? It seems that the professors have done another meta study. That means none of this “most comprehensive dataset ever assembled” is actually new – it simply gathers together all the data they can find from as many studies as possible. The findings are not new either. In fact they concede that too, their work simply confirming the “fundamental law of highway congestion” suggested by Anthony Downs (1962; 1992). Or the equally extensive study by MVA/ESRC in 1998 “Traffic Impact of Highway Capacity Reductions” (1998) which showed that the obverse was also true. That when you lose highway capacity the congestion does not get any worse either. People adjust their driving. Indeed I have lost count of the number of times I have repeated the mantra: traffic expands and contracts to fill the space available. They go on to point out that building new transit capacity of itself does not cure congestion either. And that is because if the new transit takes some auto trips off the road then those drivers are replaced by others. Indeed the only measure that reduces congestion is road pricing. That does not mean we should not build transit. It is also worth repeating in this context that the Vancouver experience – detailed in yesterday’s posting and quoting Peter Judd, is that automobile demand can be reduced by sensible land use policies that enable more people to choose to walk to work than our current low density sprawl everywhere outside of downtown Vancouver. The mode split on Central Broadway (the second largest concentration of jobs in the region) being not that much different to the rest of the region. The case for transit should not based on a false assumption – that it cures congestion – because it is clear that it has not. That does not mean that congestion is inevitable – but it has mainly so far been left to regulate itself. The outcome that produces is an equilibrium which produces a general level of equal dissatisfaction – the compromise that dissatisfies everyone equally. We all complain about congestion but we continue to add ourselves to the traffic flow when it suits our own purposes. That is because congestion is an externality: the cost is borne by everyone, not just those who make the decision to add themselves to the traffic flow. Since the study is all about transportation – and transportation is a derived demand – the lack of discussion about land use in the Streetsblog article is disappointing but not unexpected. The City of Vancouver made a decision not to add to road capacity. Copenhagen went an important step further, it decided to steadily reduce the capacity not just of the roads in terms of vehicle movements but also of parking. It indeed has been argued – by Gordon Price (and no doubt others aware of the obvious) that the City simply could not afford to buy enough land to widen any of its arterials. He based his calculations on the cost adding short lengths of turn lanes to some Knight Street intersections and then extrapolating that to the length of the current system. Many advocates of road building have gone on to assert that more road capacity is necessary to accommodate growth. This can be challenged on several levels. Firstly, is growth actually desirable? And if you do not accommodate it with new road, what then happens? Most places that are growing get roads automatically – the developers pay for them. In most places developments are not permitted to proceed until the traffic studies are done and commitments made to accommodate more vehicle trips: a self-fulfilling prophecy. What the road advocates ignore is that there are plenty of examples where there was no room for more roads yet there was still growth. Both Vancouver and New York demonstrate that. And in both cities the inefficiency of relying on single occupant vehicles for personal mobility is well understood. There are more people – and jobs – in both places, but they get around without (on the whole) being accompanied by tons of personal machinery. They walk, ride bicycles and use transit. There are taxis, rental cars, and other mobility solutions like car co-ops, but those are not for every day trips. Indeed, even the people who drive all the time will usually admit they do not actually need their own car for every commute – but worry about what would happen if they might need it. Providing decent alternatives to allay that fear is a small but important part of policy making that seems to be largely neglected. Vancouver, for instance, has had a well documented taxi shortage for years. The condition persists simply because of the political power wielded by the very small number of people who own taxi licenses. Indeed the only puzzle that I think is worth considering is why, given the weight of the evidence that has been available for years, we persist in making decisions that defy reality. The same process is clearly at work with man-made climate change. And largely due to the actions of the same people. Yet we continue to be locked into denial and debate, when the path we are taking is clearly disastrous. And those who point out the error are castigated. Again, a relatively small number of people with a very clear agenda tied to their own wealth seem to have dominated both debates and in BC seem to be winning much of the time. The carbon tax – and its futility – being only the most recent case. It is also worth repeating that we need to consider what kind of place we want to live in. Again, we need to examine the sort of place which people move towards when given a choice. The fact that house prices increase as accessibility increases should give us a clue – especially if we express some belief in the wisdom of markets. Vancouver has some of the highest priced real estate in the world. So the deterrence effect of our supposedly intolerable traffic cannot be that bad, can it? Any more than it has made apartments on Central Park West in Manhattan cheaper. The suburbs had to be sold, and sold aggressively. Just as cars were to people who, up until then had been managing quite well without the need to own their own horse and buggy. And, as was pointed out many times, the suburbs were not the happy paradises their developers had promised. And commuting was – and still is – regarded as a huge waste of time. Yet we still find ourselves engaged in debates about density. Even though the arithmetic of population growth on a finite planet – or within a region constrained by mountains and sea – is unarguable.